Last night I met some friends for $5 margaritas and tacos in Williamsburg. It was hot outside, but we sat in the shady back garden, which was lovely until I started trying to claw my nose off of my face. I’ve never had an allergic reaction to anything before, so it wasn’t until my friends suggested I should go around the corner and buy some Benadryl that it even occurred to me that might be the problem. By that point, I was one margarita in and every inch of my skin itched, and the Benadryls were making it impossible to hang, even after moving indoors. So I left the restaurant and headed for the train home, but found myself in a natural foods grocery store, where I wandered around in a daze and bought things I didn’t need, like a pint of chocolate milk in a glass bottle, french onion dip, and Vitamin E soft gels. I got home at 9:30, took off my clothes, got in bed, and decided I had to drink the chocolate milk right then and there because getting up and putting it in the fridge was inconceivable, and I didn’t want it to go bad on my bedside table over night. Seconds after drinking an entire pint of chocolate milk, I turned off the light, passed out, and had a dream that I went to this bar in Morocco that was a pocket in time (duh, like there’s any other kind), where I had a long conversation with my mother’s German grandfather who died years before I was born, only he was about 45 years old and dressed in a navy polo and khakis like it was timelord casual Friday. He had to jet because bad guys were on his tail, naturally, but before he left he gave me a piece of paper covered in notes for me in code, some written in 1333, some written in 2058, and that’s when I realized he knew we were going to meet at this Moroccan time pocket dream bar, even though he’d gone through this ruse of “what’s your dad’s hair color” and so on, and also I hadn’t really burst any bubbles for him when I let it slip that my grandparents got divorced eventually. Anyway, he ducked out a back door and the bartender assured me that this was a safe place where I could work on deciphering the notes and get some rest before beginning my travels. I woke up at 5 am with a full bladder, reaching for my pen so I could start decoding. So yeah I think I’m going to start doing drugs. The train one, I did that one. Look! If you scroll quickly, you can see the past 21 months of my life flash before your eyes! If you will humor me for a moment, I would like to talk about the Cringe book. Yet again. Without sarcasm this time! I realize a lot of people probably groan and stop reading when they see that word here, and that’s okay, because I’ve spent a lot of time sick of talking about it too, but today, I want to talk about it, because today, I got to hold the actual finished book in my hands, and that was the best feeling I have ever felt in my life. It was a little overwhelming, and I won’t say I didn’t cry some tears of joy. I wanted to have everyone I loved in the room with me right then, to hug them and somehow have them feel this way too. I remember when I first got the book deal, I remarked on how excited I was, and Ariel said wouldn’t it be great if you could bottle that feeling and dab a little behind the ears sometimes. But this feeling is beyond dabbing. I would tie off and shoot this feeling into my arm every morning if possible, like some kind of heroin that makes you feel proud of yourself afterwards. I had no idea there could be a natural high this intense. I can’t even imagine how much more powerful this feeling would be if I’d written the whole book myself, cover to cover, but I think that might make me pass out, so I’m going to build to that. I can’t really call the Cringe book my book, since it’s made up of contributions from so many funny people, but it’s definitely my baby, the thing that’s been at the front of my mind for the past 21 months, and I’m so proud of how it turned out. I am so proud to have worked with a collection of such talented, hilarious people. Wait until you see this list. They are so funny. Having spent so much time so close to this, I became oblivious to the humor after awhile. When I turned it in, my editor said, “Is it funny?” and I said, “Uh, I hope so? To be honest, I have no idea anymore.” Then she started reading and belly laughing and I decided I would live another day after all. I’ve loved watching various people read it for the first time and seeing their reactions. I wish I could show it to you all, right now. I promise I won’t stare while you read. I have so much more to say and share, but I’ll wait until closer to its release—two months and one week! There are so many exciting things planned! But right now I want to sincerely thank you all for being so supportive and kind and encouraging throughout this process, and for being a part of it. That really meant more to me that you know. Good morning! I want to thank you for all the nice birthday wishes. I had a really great day. Thanks to having slowed my roll to a near-standstill lately, I managed to get just tipsy enough from two pint glass-sized vodka lemonades at dinner to be a very happy, smiley drunk for the rest of the evening, then sweated it all out during the show, and woke up this morning hangover-free, so I’d have to say that I’d really recommend 31 so far. I’m fortunate enough to be almost constantly surrounded by friends who love and humor me, except for when I want to be alone and do my crossword puzzles in bed, I have nice hair, and tonight is my semi-annual date with Robert Plant. If I ever complain, I want you to glare hard and silently point at me until I shape up. Hello! Today is my birthday. I am celebrating by having a fudgesicle for breakfast, wearing a dress that may be too low cut but it’s too late now, and going to see the Breeders tonight. Do you know who else has a birthday today? Kim and Kelley Deal. I hope we all smear birthday cake in our hair together. I didn’t want to announce my birthday like a five year old, but I really wanted to tell you the part about Kim and Kelley Deal. I wrote today’s guest-post at Dooce, so if you’re in the mood for relationship advice from a five year old 31 year old, knock yourself out! If you would like to see the best thing I've received for my birthday so far, from my friend Tony, knock yourself out again! ruby, originally uploaded by Sarah Brown. This is my great-grandmother Ruby, circa 1949. This photo is sort of legendary in our family. After hearing about it for years, my mom finally had it reprinted and framed for me. It sits on my desk, right over my computer screen. There are lots of Ruby stories, aside from the story of this photo. According to my mom and her brother and cousins, if you called Ruby anything other than Ruby, you were in big trouble. You got spanked for calling her grandma. 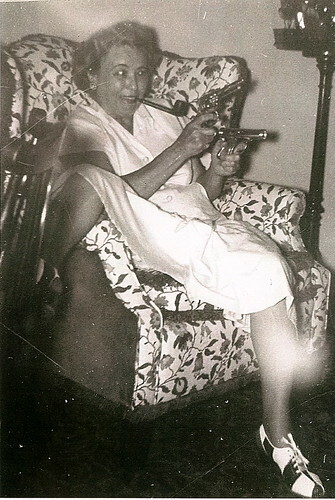 When you spent the night at Ruby and Granddad’s house, Ruby would feed you a glass of milk and little powdered donuts for breakfast, and then tell you to hang on a minute while she went outside and picked some fresh jalapeno peppers from her garden, which she would wash down with a glass bottle of RC Cola. Another good Ruby story is how, when she was in her seventies, she was gardening one morning at her house in Midland, Texas, and a giant snake bit her. She hacked the snake into pieces with her hoe, put the pieces in a brown paper bag, and drove herself to the closest veterinarian, where she dumped the bag's contents on his table and asked if it was a poisonous snake. The vet looked at her like she was crazy and said, "Lady, go to the hospital!" Ruby was a big fan of boxing. In the '50s and '60s, she had a small room turned into a den, with the only TV in the house, and on the night of a fight, she'd sit on the edge of the couch, yelling and swinging along with the boxers in her little shirtwaist dress. Granddad took Ruby took a boxing match only once, in the 1940s, and she was loudly rooting for the boxer the man in front of her was against. He turned around and said, "Lady, you need to shut up!" so she socked him across the face with her handbag. Granddad pulled her out of the match and never took her back. My aunt Teresa has been doing a lot of genealogy tracking on our family over the past year. We've noticed that Ruby ages only eight years over the 1920, 1930, and 1940 censuses. I am very sad to have never known Ruby. Sometimes I feel more related to her than some of my relatives I’ve actually met. Fun fact: Ruby is sitting in the same chair in this photo that I am sitting in in this one. Please allow me to interrupt this steady and furious stream of posting to my website to mention that Cringe (or Crunge, as two people have referred to it in the past week) is tonight, Wednesday, June 4, at Freddy’s. I always feel bad when the monthly Cringe posts are only separated by one or two other real posts, but there’s a lot of stuff coming, plus some good big news, hopefully by the end of the week, if you’re into that sort of thing.